We are experts in Executive Function, providing customized and comprehensive support for students and adults since 2006. Our coaches help students improve academic performance and adults achieve better work-life balance by learning the skills necessary to be more effective and productive in school and beyond. Our coaches are rigorously trained and supervised professionals with master’s level degrees or higher. Using students’ academic work as a springboard, our coaches teach students how to organize, plan, prioritize, manage time, maintain focus, self-assess, and study efficiently. Similarly, in working with adults, we use their real-life demands to show them ways to be more effective and productive. In 1:1 sessions either in person or online, coaches help clients identify, employ, and evaluate tools and strategies that address their specific needs. Our coaches customize their approach to each individual depending upon a their attitude toward changing work habits. We use a research-based model to attain clients’ buy-in to improve their self-management skills and lead to lasting change. Many of our clients are bright, capable students in late elementary school to college who are not achieving their potential as a result of ineffective work habits. Some have diagnoses such as ADHD or other learning differences and see coaching as excellent additional support to school-based interventions. Some of our clients have emotional challenges such as anxiety which impact their ability to work effectively. Other clients we work with have no formal diagnoses yet benefit from learning more effective ways to manage their academic or workplace demands. Self-management skills are increasingly important in a complex world with many distractions and competing priorities. People who learn these skills are better equipped to navigate the challenges of school and adult life. 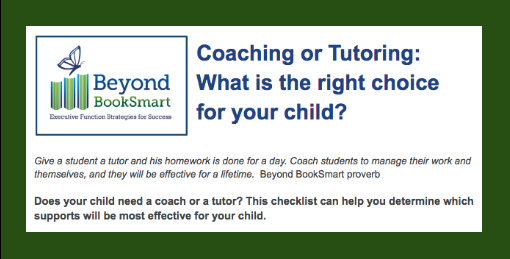 The goal of Executive Function coaching with Beyond BookSmart is to have an independent, confident student who has a deep knowledge of him or herself as a learner. That understanding guides the use of the student’s personal toolkit of work strategies developed throughout the coaching process. Find out how Executive Function coaching can benefit your child, yourself, or another adult in your life. Choosing between subject-area tutoring or Executive Function coaching for your child? Download our checklist to help you select the right support for your child's needs. Executive Function Coaching has been a lifesaver for our teen son. He is very bright, creative, and talented but he struggles with the multiple demands of high school work and had not been able to keep up with the pace of school life. Once he began getting Executive Function coaching from Beyond BookSmart, we saw a tremendous gain in his ability to manage the work expected for his grade level.